Recently, I've been on the gaming grind a ton. With new MOBA seasons, the reemergence of the Arena Shooter, and H1Z1 making its presence felt on the team game scene...it's been busy out there for us multiplayer addicts. Booting up my rig has felt a lot like clocking in for work, and I needed a vacation -- badly. 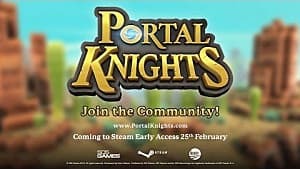 So when I was handed a copy of Portal Knights, an offbeat action adventure RPG by Keen Games coming out of Early Access, I figured "why not?". 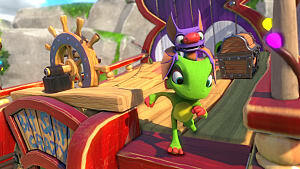 With a solid rating on Steam, an army of thumbs ups, and a Very Positive overall rating...it's gotta be good, right? If you're waiting for the inevitable second boot to fall from a sentiment like "how bad could it be", you'll actually have to keep waiting. Portal Knights is really smooth. The characters, reminiscent of modified Lego people, all move fluidly. 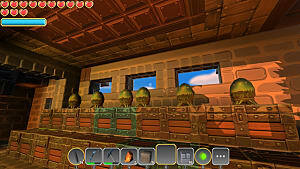 The worlds are vibrant, and range from powerful pastel palettes to dingy dungeon crawls. The animations flow (though chaining different actions together does feel a bit sticky at times). And once you get the hang of the game, nothing feels like it demands too much of you. Really, they've given you a relatively beautiful (if block-based) world to go adventure around in -- and since most enemies and obstacles can be beaten by rolling around and hammering R2, you have plenty of mental space to dedicate to taking it all in. 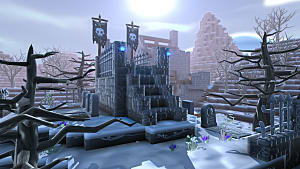 Speaking of rolling around and hammering R2, Portal Knights offers a fairly huge upgrade over its "smash blocks and build things" relative Minecraft, sporting an active combat system that reminds me more of a toned-down Dark Souls or Platinum title than it does Steve relentlessly pickaxing his fiftieth skeleton down in the mines. "Toned down" is the operative phrase there, however. While there are three different classes to choose from (Warrior, Ranger, Mage), a minor elemental system in play, and even Boss Fights, nothing really required you to do anything too complicated to achieve victory. Sure, you can be an agile Ranger, swiftly punching holes in your foes with arrows. You could be a mighty Warrior, bellowing and slashing foes to bits. You could even be a Mage, a wielder of arcane and elemental forces that can cause nature itself to rise up and smite your foes. ...but in the end, you'll still mostly be rolling in a circle hammering R2. 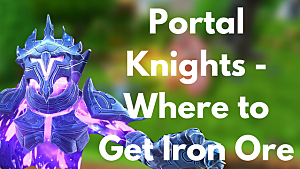 The classes and weapons feel more like flare than actual core differences -- like various skins you could put on Portal Knights to make it feel like you'd changed a little something. Whether I picked a bow, a wand, or a sword, I inevitably defeated most enemies with a combination of "roll around" and "basic attack". So while the attacks may be different, they certainly didn't feel different. Of course, you at least don't have to break your right trigger alone. 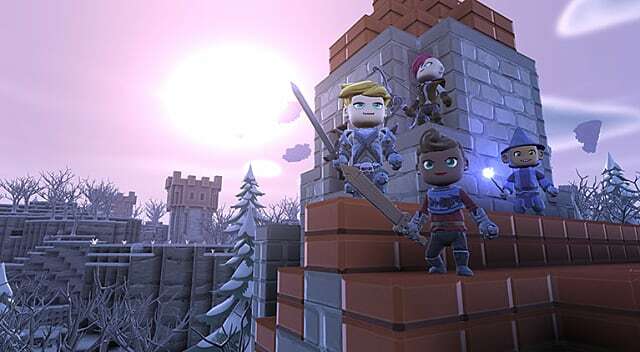 Portal Knights does have the outstanding bonus of good multiplayer -- and four of you spinning in circles is often a lot more fun (and less worrisome for bystanders) than rolling about by yourself. 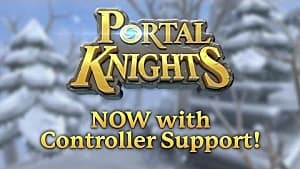 An archaic form of multiplayer called "split screen" is also available for those of you who want to jam some Portal Knights in a good ole-fashioned couch co-op session, as well. Lastly, Portal Knights is, despite the action/adventure designation, a "blockbuster" -- more or less the "smash bricks with your face until you can make things to smash better bricks" gameplay we've come to know (and many have come to love) from Minecraft and Minecraft-likes. Right from the start in Level 1-0 (more or less "Big Glowy Tutorial Island"), you can get right to chopping down trees and shattering boxes with your bare hands (or starter weapon) to find wood for a crafting table. You can use the crafting table to make a pickaxe. You can then use the pickaxe to get stones more quickly, so you can upgrade your gear. That allows you to more quickly defeat monsters to get to materials you need to upgrade your crafting table...you see where I'm going with this. Fans of the Minecraft style of gameplay will feel immediately at home in Portal Knights' deep crafting trees, and will soon find themselves pickaxing away at rare mineral deposits buried in the giant floating islands that make up the game world. Now, you and I both know that technically we're supposed to be defeating portal guardians to reunite a world shattered by The Fracture...but we're both pretty sure we have enough dirt to make a magical hovering path up to that big floaty island there. It's not like the portal guardians are going anywhere, right? Right. The downside to the relatively robust crafting system, if any, may be that a great many of the items felt like Upgrade Clones, despite the occasional individual bonuses attached. Shiny Metal 3 Sword is, in most cases, the same as Slightly Less Shiny Metal 2 Sword -- it just does a bit more damage. With a Souls-lite combat system and Minecraft gathering and crafting, you may be wondering why I left that "What could go wrong?" hanging in the air at the beginning. Aren't those good titles to emulate? Sure they are. 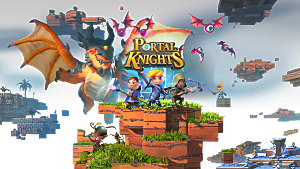 But Portal Knights' biggest problem, if anything, is that it captures its comparative games very well in mechanics -- but not so much in spirit. While combat feels like it came from an action RPG, it's a superficial feeling -- the depth of combat found the source material just isn't translated here. 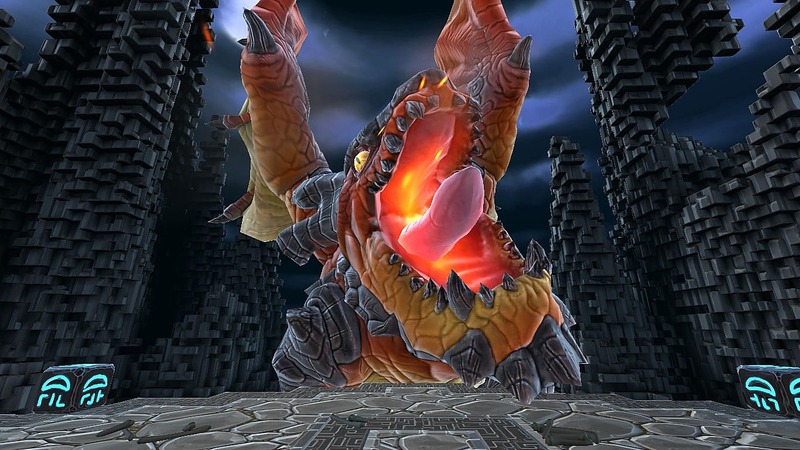 There's not the difficulty that usually comes with that sort of combat system. Similarly, the Minecraft-esque building segments do an admirable job of capturing the joy of breaking trees with your face to build a log cabin -- but stop short of some of the truly absurd things you could engineer in the iconic block-builder. About the coolest thing you can make is a stone cabin a.k.a. "sweet castle". 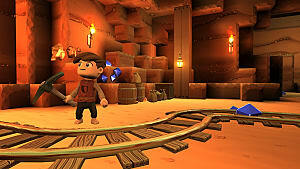 All of this leaves me feeling a bit confused after having played Portal Knights -- Souls without difficulty, Minecraft without complexity, RPG without depth. 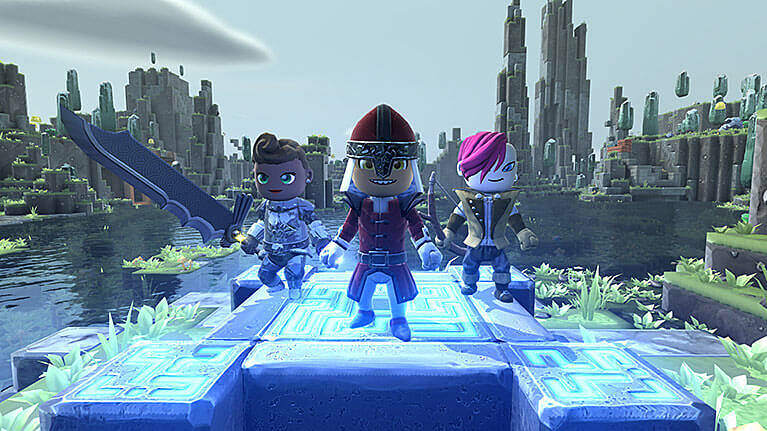 Portal Knights is a smooth, shiny, pretty, musical little number -- but who exactly does the game want to play it, and will they feel like they've played it before? 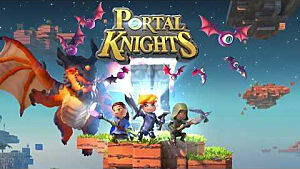 For being a relatively fun romp through a rather pleasant little world, Portal Knights earns itself six stars -- but for giving me the unshakable feeling of deja vu right from Level 1-0, they'll have to craft the rest. 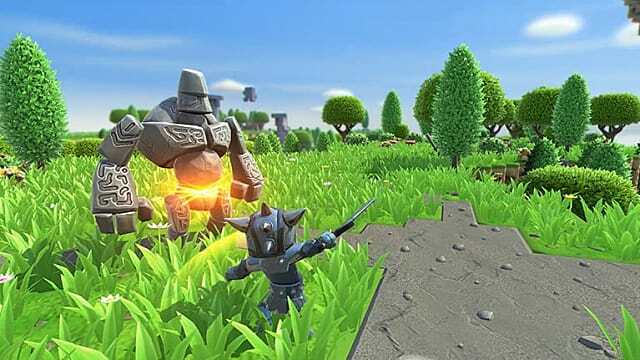 If you want to see whats behind Portal #2 yourself, you can pick up Portal Knights for $14.99 on Steam as early as today, and on PS4 or Xbox One within the next week (May 19th in EU, May 23rd in NA). Portal Knights is a fun experiment in genre combination - but one that doesn't exactly open any new doors.